This blend of An Hui's Keemun Black tea with dried rose petals offers a treat that is rich with Keemun goodness, and yet you can make out the subtle aroma of fresh roses with every sip. Rose Keemun is truly a lovely blend suitable to be shared with your friends and family anytime. The complexity of Keemun's taste is further enhance by the presence of rosy fragrance. Each sip offers you the subtle sweet aroma of fresh roses. 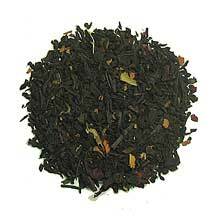 Slender, curled black tea leaves with some rose petals in the mix.